The Brompton is a bike which rides superbly, is safe, agile and fast, yet folds easily and quickly into a highly-compact and portable package. The result is a vehicle that increases your sense of freedom and independence. Brompton folding bikes are a great solution if your commute requires a train journey for part of the way or if storage space is an issue at home or work. They’re also a fun, eco-friendly and stylish way to get about. Made for taxis…made for speed…made for trains…made for escaping…made for offices…made for you. Brompton Bikes are British bikes; engineered in the UK and handmade to order in London since 1975. They are made mainly of steel for strength and stiffness, but are also available in a superlight frame, and are designed to be practical and light enough to be genuinely portable; actual weight depends on model and configuration, but ranges from 9 – 12½ kg (20 – 28lbs). The dimensions of the folded bike are: 585mm high x 545mm long x 270mm wide (23″ x 21.5″ x 10.6″). The frame or saddle can be used as a handle, so it carries like a small suitcase, lightweight and easy to manage. Small rollers allow the bike to be pushed into inaccessible corners. We will be stocking a selection of off the peg models that are available and ready to go. There are also custom build Bromptons available, with a large amount of options & colours available. You can talk to one of our Blazing Saddles Brompton experts who can help you to choose any variations on gears, pedals, handlebars, brakes, mudguards, lights, saddle, wheels, tyres, paint colours and accessories including racks and bags and panniers. The choice means you really can get a bike to suit your needs. The custom builds are hand made to order so expect a wait of a few weeks before your bike is ready. Or choose one of the carefully chosen ready to go bikes soon to arrive in store. At Blazing Saddles, we are an official Demo Dealer, which means you get to try our brand new demo bike and get a feel of what the Brompton has to offer. Take it out, ride it, fold it and enjoy it! The benefits are many and there are plenty of reviews by people who’ve given this great little machine a go. 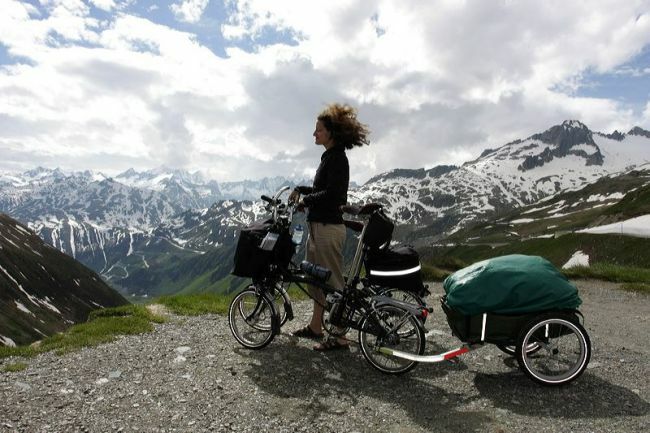 Take a look at our Blog for an inspiring insight into where a Brompton can take you.